Our luxurious, four master suite, Non-Smoking, Villa Home with pool is located in one of the most exclusive neighborhoods in all of Cabo San Lucas. 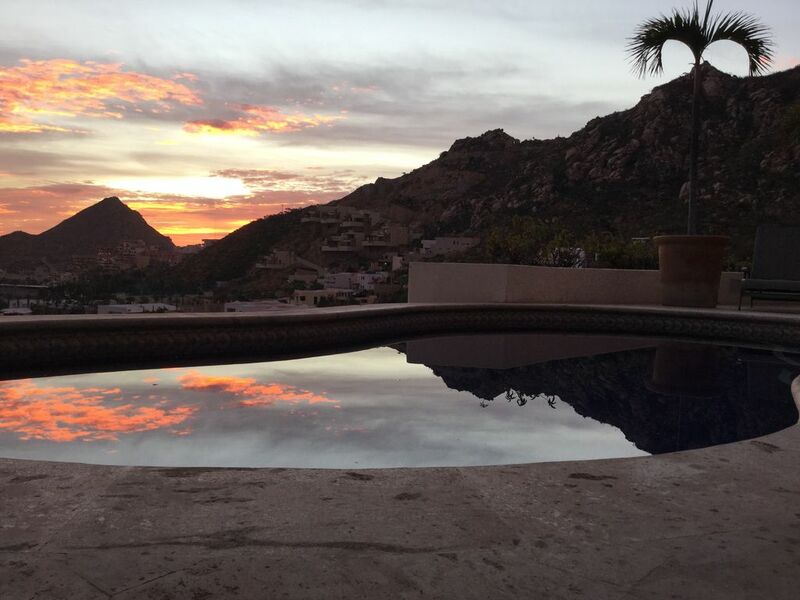 The Pedregal, 'on the cliff' is a gated community with a private beach and tennis courts. Come join us in our privately-owned, four master suite, three-story home. Sit in our pool and gaze at the spectacular views below, day or night. Cook in the kitchen with everything a master chef desires or let us arrange your own chef for the job. (Special cooking requests are not included in the price. However, we can arrange almost anything.) You will enjoy a stereo system inside and out, internet TV-Roku, barbecue, and lots more. Reserve your date now for a first class holiday and be the next on a list of very satisfied and returning clients. Private beach in our community. Located right above downtown Cabo San Lucas, walking distance. Located right above the marina with panoramic view. 80 Camino Grande was a great house to spend the week between Christmas and New Years for our group of 7. Wish the town of Cabo never built that gigantic grey civic center that completely blocks the view of the marina. The pictures on website were obviously taken before it was constructed. Others say you can walk to town. I’m sure you could walk downhill very easily but the walk home up the steep terrain might me a challenge for some. The grocery store at the bottom of the hill is well stocked. We loved the kayak tour along the coast. We’d suggest you charter the Chica Mala. Great crew. We rented horses at Ranch near CaboReal Golf. The guys in our group enjoyed golfing at the CaboReal course. Overall great time. Our group had a great vacation at Casa de Lanikai. The location near downtown was perfect, and we all appreciated having our own en suite bathrooms. The kitchen was well equipped and we enjoyed using the pool area while enjoying the marina view. The built in speakers outside were a nice touch as well. Look forward to our next trip! Great property in close proximity to Cabo. Views are terrific and the house has a great floor plan to accommodate the whole family. Would definitely stay here again. The villa was exactly what our group needed and James and his staff were extremely helpful before and during our stay. We enjoyed our stay in your home. It was well stocked in the kitchen. The bedrooms and showers were comfortable. We loved all the tile. The management company were helpful. We loved the pool area and patios. We found everything as it was described in the vrbo site. The location was close to the harbor, just a bit of a short uphill walk back to the home. Gated community was nice and quiet as we liked. My party enjoyed casa de lanakai very much. The pool and each bedroom was very nice and enjoyable. Would definitely stay here again. We are located in a private community called the Pedregal right above the marina with great views and still walking distance to town and beaches.